Great shot! The light is magic and the look is amazing! You can almost tell it’s Paris just by the light! I love the association of white, red and black! And with the hat it is great! That photo is sooo nice. What a beautiful, dramatic shot! The scenery and lighting are stunning and I’m loving the masculine-inspired style! That’s a very unusual masculine look. A little too masculine may I say, but with such a beautiful face, you obviously can try anything! So very 90′s. I love it! Great color combination in an adorable style! I always love the shots with a strong architectural element, and with the addition of the red and black clothing this one is really stellar! Great shot–why am I not surpised? I think she looks timeless–you could label that shot with many different years…. Love the hat & color combination! Nice outfit, love that red pant! I think the menswear trend for me is over, although I like this on her. Menswear was fabulous when the women’s movement was happening, so liberating. Now I like to wear something more feminine. Love this outfit, a little tuxedo like but in a whole new jacket. Like it! She looks like Marie Marot. Love her strong yet simple allure. I just can’t imagine living somewhere where the buildings all look like that. Or, rather, I can. I could wear it head to toe myself. Amazing, the white background helps to highlight the outfit. 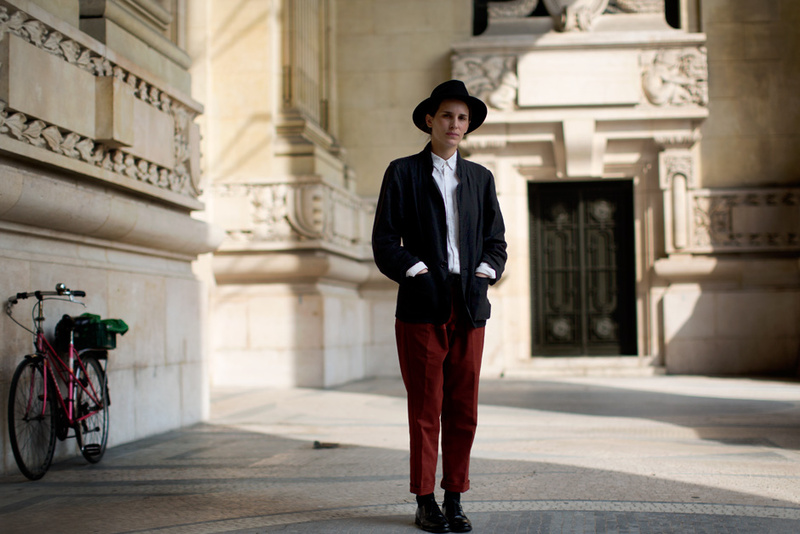 I love Marie Marots style ! The red of those trousers.. ooh..
Neat! I have red trousers and a black blazer, think I’ll recreate this outfit tomorrow. the light, the architecture, the pops of red–and the time placing bike! Love it all.